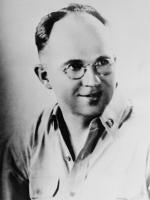 James A. Michener, by Vincent Cianni, circa 1993. There are many ways to judge a writer's achievement. 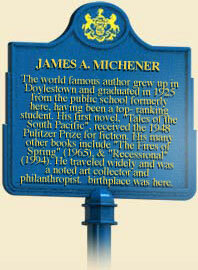 In the case of the versatile, prolific, and ever curious James A. Michener, the numbers tell a remarkable story. Across a span of half a century, from the publication of Tales of the South Pacific, his Pulitzer Prize-winning debut, until his death, at ninety in 1997, he put millions of words on paper, crafted some sixty books almost evenly divided between novels and non-fiction that sold somewhere between 75 million and 100 million copies worldwide, donated more than $100 million to charity, and sent the imaginations of countless readers wandering through time and -quite literally-space through the pages of his epics. He was even awarded the Presidential Medal of Freedom. 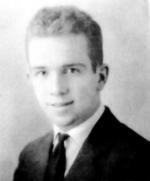 James Michener, Graduation picture, Doylestown High School, 1925. But, of course, in the end, writing is not about numbers, no matter how impressive they might be, and that is something of which Michener himself was quite aware. Admitting "I have never called myself an author. I am a writer," he nonetheless craved acceptance as a serious man of letters. The critics never fully obliged. While praising the scrupulousness of his methodical research, they scorned the denseness of his prose, the stockness of his characters, the convolutions in his storytelling, even the very weight of his tomes. "Practically entire forests have been felled to produce such trunk-sized novels as Hawaii and The Source," complained one. Readers, on the other hand, inhaled the details of both the history and the locations that infused everything he wrote. They happily travelled with Michener wherever he was willing to take them. For a writer who loved shaping details into sprawling stories, his own beginnings would have been ideal fodder for another master of detail, Charles Dickens, and, not surprisingly, Michener loved reading Dickens as a youth. While the record may show that James Albert Michener was born on February 3, 1907, the reality is that Michener never knew exactly where or when he was born, nor who his biological parents were. They deserted him in infancy. 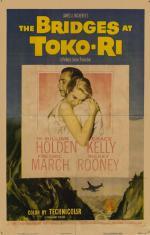 Film Poster for The Bridges of Toko Ri, 1954. Book jacket, James A. Michener’s Tales of the South Pacific, 1947. His childhood was molded by hardship. Taken in shortly after his abandonment by Mabel Michener, a Quaker widow from Doylestown who supported herself by taking in washing, sewing, and foster children, the boy grew up in poverty. By his own account, the family was evicted six times for failure to pay rent; young James even spent time in a poorhouse until circumstances settled down. He became an insatiable and curious reader. And why not? Reading offered his mind a needed alternative to his reality. Books could take his imagination places it had no other access to, something he would never forget. By fourteen, he was so gripped by wanderlust that he hitchhiked the country for several months before returning to begin Doylestown High School. His high grades and athletic prowess earned him a scholarship to Swarthmore College, where, in 1929, he earned degrees in English and history. From there, his route to best-selling, prize-winning author was circuitous. He taught private school and college, went to graduate school, and edited academic textbooks before joining the Navy in 1942, where he was eventually posted to the South Pacific as a historian. The stories he collected there were published as Tales of the South Pacific in 1947 and earned the Pulitzer Prize for fiction a year later. Michener returned to book publishing after World War II and continued to write on the side. That changed in 1949 when Richard Rodgers and Oscar Hammerstein, Jr. adapted Michener's book into the smash Broadway musical South Pacific. Michener's share of the royalties freed him to write full time. Over the next decade, he returned to the Pacific several times in his fiction and nonfiction, most prominently in the novels The Bridges of Toko-Ri and Sayonara, both of which, like South Pacific, became popular movies. Then, as Hawaii approached statehood in 1959, he penned Hawaii, the first of his massive narratives to merge location with a sweep of history. Before he was through, his novels would take readers to Afghanistan (Caravans, 1963); Israel (The Source, 1965); Spain, Portugal, and Africa (The Drifters, 1971); Colorado (Centennial, 1974); and South Africa (The Covenant, 1980); as well as the eponymous Poland (1983), Texas (1985), and Alaska (1988). Still, the world was too small for Michener's reach. His 1982 novel Space examined the American space program from its World War II roots to the early years of the shuttle. His overarching themes ranged from exploration and history to nature itself and how the land marks its inhabitants every bit as much as inhabitants mark the land. One of his best-received books would be one closest to him, his 1992 memoir, aptly titled The World Is My Home. Other Michener nonfiction include Voice of Asia (1951); Iberia: Spanish Travels and Reflections (1968); Kent State: What Happened and Why (1971), Sports in America (1976), and two earlier tracts on politics, Report of the County Chairman (1961), and Presidential Lottery: The Reckless Gamble in Our Electoral System (1969). The James A. Michener Art Museum, 138 South Pine Street, Doylestown, PA.
A lifelong liberal, Michener was a fascinated observer of and participant in politics. In 1960, he chaired the Bucks County committee to elect John F. Kennedy as president, served the administration as chairman of the Food for Peace Program in 1961, and then ran unsuccessfully for Congress as a Democrat from Pennsylvania's 8th District in 1962. From 1967 to 1968, he served as secretary of Pennsylvania's Constitutional Convention. In the 1970s, he travelled to China with Richard Nixon. The world was, indeed, Michener's home as a writer. He would settle for months, sometimes years, in the locations he found himself drawn to. In the 1980s, he and his third wife planted roots in Texas, and Austin became Michener's address for the rest of his life. Michener died in 1997 of kidney failure, shortly after refusing further dialysis. Since his death, his legacy flourishes perhaps more in his largesse than in his large literary output; he carefully gave his great fortune away. "The decent thing to do," he would say, "was get rid of some of this money." And he did. He donated his papers to the University of Northern Colorado and to the University of Texas, where he also established the Michener Center for Writers; contributed generously to Swarthmore, his alma mater; and gave some $20 million worth of prints-he was an avid collector-to the Honolulu Academy of Arts. A little closer to his beginnings, the years of effort he put into establishing a regional arts center in the 1960s in Bucks County were finally rewarded in 1988 with the opening of the James A. Michener Art Museum in Doylestown in what had once been the old county jail. Stephen J. May, Michener: A Writer's Journey (Norman: University of Oklahoma Press ), 2005. Lawrence Grobel, ed., Talking With Michener (Jackson: University Press of Mississippi), 1999.